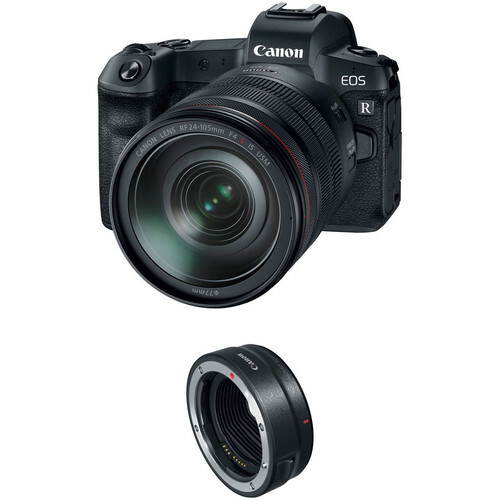 Mixing a new camera with the ability to use your legacy glass, the Canon EOS R Mirrorless Digital Camera with 24-105mm Lens and Mount Adapter EF-EOS R Kit from B&H bundles the full-frame mirrorless camera body and standard zoom RF 24-105mm f/4L IS USM lens with the Mount Adapter EF-EOS R.
Focusing on the camera itself, the EOS R features a high-resolution 30.3MP full-frame CMOS sensor along with a DIGIC 8 image processor. The combination of these technologies offers a wide sensitivity range up a native ISO 40000, fast continuous shooting to 8 fps, and UHD 4K30 video recording. In addition to imaging, the sensor also facilitates an advanced Dual Pixel CMOS AF system, which uses 5655 selectable points for quickly and accurately acquiring focus. This focusing system is also sensitive down to EV -6 for working in impressively dark conditions. The AF system is also perfectly matched to the UHD 4K video recording capabilities, which are also rounded out by Movie Digital IS to minimize camera shake, built-in Canon Log gamma for a greater dynamic range, and 4K 10-bit 4:2:2 output over HDMI for even greater color control. Box Dimensions (LxWxH) 11.0 x 9.0 x 7.5"
Box Dimensions (LxWxH) 5.2 x 4.7 x 3.3"
EOS R Mirrorless Digital Camera with 24-105mm Lens and Mount Adapter EF-EOS R Kit is rated 4.6 out of 5 by 104. Rated 5 out of 5 by Tyler from Amazing camera! I shoot 4-5 days a week on Canon's 5dmkiv and 5dsr and I wanted to try a mirrorless for gimbal work. And this works beautifully! Great video and stills even at 2000 and 2500 iso! I purchased the battery grip and EF lens adapter for more versatility off the gimbal, too. It shoots CR3 files which at this time aren't supported by Capture One or Lightroom. Initial processing in Photoshop yields impressive results. The lens ring and programmable slider on the back are nice touches and quickly became second nature operating the camera. The overall build feels great, especially with the optional battery grip. Highly recommended. Rated 5 out of 5 by Scott from Simply Amazing Coming from a 5D2, this was a bit of a learning curve. Since the entire camera and every button is customizable, Ive had a hard time figuring out what I want each button to do. Now that Ive got each one customized to my shooting style, I am truly impressed! Is it perfect? Nope, nothing is! But it suits my style perfectly! Image quality far surpasses my 5D2. The autofocus is dead on, EVERY SINGLE TIME! Build quality is top notch, it just feels SOLID! If your on the fence from reading some of the negative reviews, dont be! This is a solid camera that I believe will serve me very well for many years to come! Rated 5 out of 5 by Andy from Natural progression for Canon After reading negative headlines about this camera I was skeptical but I think Canon has made a nice polished package here. I own a Canon 5D Mark IV and this camera seems identical in a smaller form factor, plus things like 4K time lapse make it even more useful to me. The one con is using the adaptor for EF lenses since it makes it larger. Lenses work as expected but the length of the camera is just so large with an adaptor. As RF lenses are released this will be less of a worry for me. This camera has great image and video quality and I’d recommend it to anyone already in the Canon ecosystem. Rated 5 out of 5 by Fred from Upgrade for 6D This camera was an upgrade of my five year old 6D with approximately 100000 shots on it. I was worried a little about the learning curve for the new camera, but It was relatively easy. I like having the electronic view finder to see the exposure before firing the shot. I really like the fv mode which gives me ultimate control. One thing is that it allows for easy switching between stills to video and back by just using the record button. It is taking me a little while to get use to the focusing system though, but it is definitely better than my 6D. Rated 5 out of 5 by Robert from Love It !!! Seamless transition for Canon users. Very intuitive. EVF is amazing. Low light work is amazing. I think 30mb files are the perfect size. Lens is crisp. Still use my 5DMIII but this camera has altered my work flow. Looking forward to a few new lenses. As far as lenses I also purchased the adapter for my EF lenses. What can I say they all work perfectly with the autofocus system. My 200mm F/2 makes this camera look like a toy but wow the images are amazing. Very happy. My tilt shift works perfectly as well especially with the manual focus aids built in. Looking forward to some of the new glass coming down the pipe from Canon. I don't care or do video so no comment there. Thanks Canon, I find myself not needing to use my reading glasses as much with this camera. Rated 5 out of 5 by Allan from Allan in Delaware Ive used the 20D, 40D 6D, 6Dll, 7D, 7d II. This camera is different. Do not jump in and start changing camera parameters. Some of these controls are not visible. First, Google Rudy Winston and Canon EOS R on YouTube. I found 3 videos. Read his walkthrough of the camera. Theres a lot to understand. Once you feel comfortable, start to modify parameters to your liking. You will be amazed at the focus speed, camera photographs quality, they really pop. I did change the file name. Start slow and easy and enjoy! Rated 5 out of 5 by Anthony from Great pictures and not too confusing So far, Im completely happy with the R. Ive had it two months and have a pretty good feel for it already, about the same transitioning to the 5D 3 from a 50D. Ive not had problems using the menu bar (for ISO) and havent hit it incidentally yet. The picture quality is superb and, with the RF 24-105L lens, the image stabilization is excellent as well. Its beautiful to be able to use the other EF, EF-S mount lenses as well, with the adapter (I got the control version which also is a nice control of which ever variable one wants to use it for). Im an advanced amateur/low end semi-pro; it works well for my purposes and I look forward to using it more. Does the continuous auto-focus work in video mode with EF lenses and adapter ? I have had mine for 2 weeks. The only thing I don't like is the slight lag / stutter / jump after taking a shot. (with image review off). You take the photo, it seems fine and then there's a split second where it stutters. Its annoying. Someone suggested I use a faster SD card. 300/ms. Anyone else tried this solution? Did it work? Any tips? I really want it to me and not the camera. I initially had the same problem. I believe it was a combination of SD card write speed and image quality settings. My image quality settings were RAW + L 6720x4480. The card was only 80mb/sec. By using a much faster card (Lexar Professional 2000x 64GB SDXC UHS-II/U3 (Up to 300MB/s Read) ) and setting image quality to CRAW+L 6720x4480 I haven't had the problem again. Yes, it's an expensive card, but a necessity for 4k video anyway. I don't know that changing to CRAW (smaller file size) helped since I did both changes at the same time. The camera has been great for me since then. Can you record to an external recorder and internally to the SD Card simultaneously? In most cases that is possible. However if you output from the EOS-R at 4:2:2 10 Bit you are not able to record internally as well. In that case you will only be to record externally. Does the HDMI support 4K out? Yes. 4K HDMI output is supported. Will it shoot double exposure in camera? You can set various aspect ratios but no markers are listed by Canon. What is the difference between the $500 for the battery grip and a KO battery when you have the battery grip available for $375? Want to make sure it's the same item. Sorry, but we are not sure what you are asking. The Canon BG-E22 Battery Grip B&amp;H # CABGE22 is the only Canon grip that will fit the EOS R camera. If you have further questions, please email us. prophoto@bhphoto.com. Does the sensor have a cover when there is no lens attached?